There is something so beautifully timeless and almost nostalgic about a container full of wooden spoons. Some have been around for generations while millions are still being produced today. Short of using them for kindling they are basically indestructible and you can use them for anything....deglazing a roasting pan to scrape up all that good flavor, stir a huge pot of soup, mix together the ingredients for your favorite pumpkin bread or simply jam everything down the disposal because you don't want to put your hand in there. No matter what the task, no matter how big or how small, the wooden spoon is there to aid you in your culinary endeavor! One thing is for sure, you can never have too many! I find when I am cooking I don't want to mix the flavors of one dish with the next (hints the reason I don't like my food to touch when I am eating....trust me, I understand how odd this is) so I go through what seems like a million different spoons for one meal. 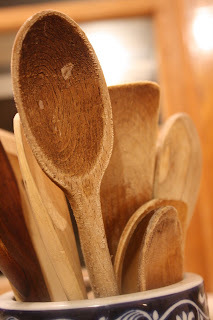 It doesn't matter when I have a fully loaded aresnal of wooden spoons at my disposal! 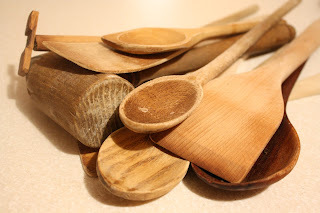 It doesn't matter what type of non-stick coating they come out with, you will always be able to use your wooden spoons and unlike most kitchen utensil that are produced today, they will surely stand the test of time as many of mine came from grandmother's kitchen and heaven knows where they were before that!